Our 2018 salmon season is officially open, and as usual we`re getting anxious to see what this season will bring. Each year's different and we're always hopeful for of great season with plenty of salmon. This winter was a cold one with plenty of snow that seemed to last forever. Spring was cool and wet, putting us about two weeks behind schedule. Our rivers typically get their first Salmon between the last week of May and first week of June. With the later than normal spring the first fish are just beginning to show up this week. There's nothing like the first pass of the day on a new pool. Water condition are perfect for this time of the season, clear and running cool. The weather man is calling for a few showers by mid week and cool whether which should maintain water levels. The Bonaventure is flowing at 75 cubic meters per second, The Grand Cascapedia at 95 which is perfect for the first week of June. and the Petite Cascapedia at 50. The Bonaventure is just starting to see its first salmon over the past few days. The Grand is beginning to produce and a number of nice fish have been landed, it will continue to get better in the coming days. You’ll have to wait until next week for the Petite, it opens on Friday the 15th. Salmon Lodge regular Fiona Gilfillan working her way down the pool. 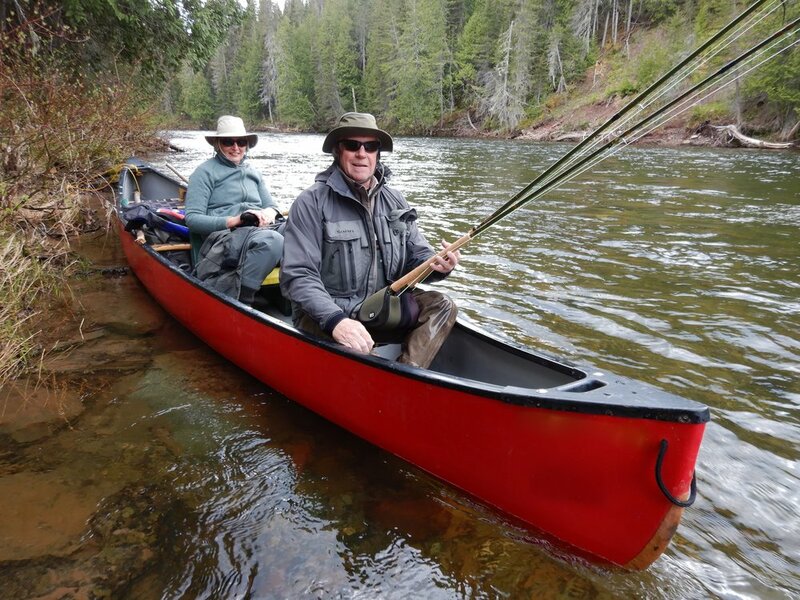 Tim and Jenny Gray have been coming to Salmon Lodge for many years, the first week of June is one of their favorite times. Ready for a float trip with Salmon Lodge guide JeanMarc Clermont. Our good friend Dan Greenberg ready for another season, may the salmon Gods smile upon you! Higher water levels call for bigger fly's like no. 2's and 4's and big tube fly's. Bright colours in clear water and darker fly's when the water's a bit stained.